Namibia is recognized as a global leader in conservation and nature-based rural development. Its State-run Community-Based Natural Resource Management Program (CBNRM) is a successful example of decentralizing natural resource management and recognizing the rights and development needs of local communities. Namibia’s CBNRM Program was awarded the prestigious Markhor Award in 2012. The Markhor Award (https://bit.ly/2oLiVBC) honors conservation initiatives that link the conservation of biodiversity and human livelihoods through the application of sustainable use principles. The CBNRM Program is the main reason behind an overall expansion of land area under conservation management. 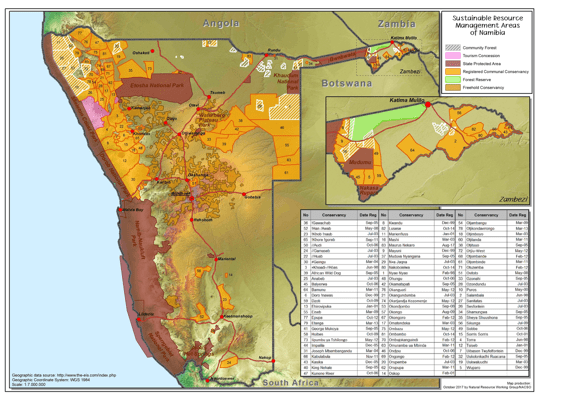 CBNRM land comprises the largest share of land under conservation in Namibia. Forty-five percent of Namibia’s conservation estate is protected under the CBNRM designation, while 38% is protected under a formal state protected areas designation. This best practice provides an overview of Namibia’s CBNRM program which successfully intersects biodiversity and wildlife conservation, human well-being, livelihoods and poverty reduction. This best practice has been repurposed from Namibia’s Fifth National Report to the Convention on Biological Diversity (5NR), latest National Biodiversity Strategy and Action Plan (NBSAP 2013-2022), and several publications of the Namibian Association of CBNRM Support Organizations (NASCO). **Please note, this best practice has not been reviewed by the Government of Namibia. Prior to 1996, rural communities on communal land in Namibia had no rights over wildlife, even though they often suffered extensive losses from human-wildlife conflicts. Hunting and poaching was rife and wildlife populations were declining. According to Namibia’s 5NR, loss of habitat due to land use change due to large-scale agriculture and mining is one of the biggest challenges to Namibia’s’ biodiversity conservation objectives. Though, such activities may benefit some sectors of the economy, they are disadvantageous to the rural poor, who are heavily dependent on natural resources, including wildlife. Additionally, severe droughts underscore the country’s vulnerability to climate change, and the long-term sustainability of agriculture. Thus, there is a need to diversify the economy, especially for the rural poor, towards more sustainable use of naturally occurring indigenous plants and wildlife, which are drought-resilient. Although known as the driest country south of the Sahara, Namibia has exceptional natural resources and an impressive variety of species and habitats. It is one of the few dryland countries in the world with internationally recognized biodiversity hotspots. Namibia’s CBNRM Program is a government program, under the Ministry of Environment & Tourism, that is managed in partnership with a number of stakeholders, which are united under the Namibian Association of CBNRM Support Organizations (NASCO). CBNRM has been in existence since Namibia’s independence in 1990. CBNRM is an important instrument to promote sound environmental management, and the sustainable use of natural resources, in a manner which empowers local communities to share the responsibilities and benefits from such management. Community Forests and Communal Conservancies are two core strategies of Namibia’s CBNRM Program. CBNRM also strengthens local institutions that promote rural development. It a tool that is effectively supporting Namibia’s government to meet its national conservation goals and the global sustainable development agenda. Namibia’s CBNRM approach also emphasizes gender mainstreaming in natural resource management. Institutional development. Good governance creates the basis for resource management and the equitable distribution of returns. Natural resource management. Innovative resource management enables biodiversity conservation and the sustainable use of wildlife and plant resources. Business, enterprises and livelihoods. Incentive-based conservation approaches enable an expanding range of rural livelihood options. Legislative and Policy Instruments: Several legislative and policy instruments have been developed by the Namibian Government since 1990, that devolve rights over natural resources to Namibians living in communal areas. These laws and polices enable communities to manage the natural resources in their areas and use them for community benefits and improvement of individual livelihoods. These include, Namibia’s Constitution (Art. 95); The Nature Conservation Amendment Act, 1996; the Forest Act, 2001; The Communal Land Reform Act, 2002; The Water Act, 2004; The Inland Fisheries Resources Act, 2003; The Traditional Authority Act, 2000. The National Policy on Tourism for Namibia aims to provide a framework for the mobilization of tourism resources, and to realize the long-term national goals defined in Namibia’s Vision 2030 (http://www.gov.na/vision-2030) and the National Development Plans, namely: sustained economic growth, job opportunities, income equality, gender mainstreaming, reduced poverty, and the promotion of economic empowerment. Strengthen community institutions and structures to collectively engage in environmental and natural resource monitoring, and in mitigation and adaptation to climate change. Women Empowerment: Despite being the main managers of natural resources on a daily basis, Namibian women often play a limited role in decision-making processes and in the sharing of benefits from their efforts. The CBNRM Program actively promotes the role and participation of women in natural resource management and decision-making. National Target 4.1, (aligned to Aichi Biodiversity Target 14) seeks to enhance area under CBNRM with benefits to local communities. The cross-cutting NBSAP theme of economics, trade and incentive measures calls for annually measuring the contribution of CBNRM program to income generation, employment creation and biodiversity conservation. The NBSAP as a future priority, calls for the increased involvement of women in CBNRM governance. A strong legislative framework, and efficient coordination between institutions responsible for the management of natural resources (fauna, flora, water, land), are important for a successful CBNRM program. CBNRM will be a successful conservation model, if adequate economic incentives are linked with environmental management, especially when private sector investment and buy-in from local communities is required for conservation success. CBNRM has the potential to generate long-term financial and ecological wealth for disadvantaged groups. Sustainable management of resources and a business-oriented approach are important concepts for the successful management of conservancies and community forests. Namibia has an expanding free-roaming lion population outside national parks. According to Namibia’s 5NR (2014), communal conservancies cover the largest share of land under conservation in Namibia (45 per cent compared to 38 per cent for formal state protected areas). Disaggregated gender data under the CBNRM Program shows that in 2012, women made up 30 per cent of conservancy management committee members (NACSO 2013). Other positive impacts of CBNRM include: legislation and policy reforms; improved conservation, natural resource management and governance; economic development; improved rural livelihoods; increased participation of women in decision making; human/wildlife conflict mitigation; improvements to local schools & clinics; improvements to rural water supplies; provision of transport for the injured or ill; support to home gardens; and improved nutrition. NASCO has developed 27 training modules for building capacities on Governance, Natural Resources Management, and Enterprise & Business, related to communal conservancies. Access training material here https://goo.gl/UgLHPZ. NASCO’s 27 Training Manuals for building capacities on Governance, Natural Resources Management, and Enterprise & Business related to communal conservancies. Link https://goo.gl/UgLHPZ. Namibia’s 5NR. Link here https://www.cbd.int/doc/world/na/na-nr-05-en.pdf.